Step 1 In a large soup pot, add oil and sauté onion, yellow pepper, tomato, garlic, oregano and bay leaf until onion softens, approximately five minutes. Step 2 Add chicken broth and shredded meat; simmer for five minutes. Remove bay leaf, add lime juice and season to taste with salt and pepper. Step 3 Divide equally among four bowls, and garnish each with cilantro and a lime slice. Serve with tortilla chips or crusty bread, if desired. Step 4 Tip: Add the lime juice just before serving; any earlier and it makes the soup bitter. Serves four as a side dish, or two as a meal with salad and bread. 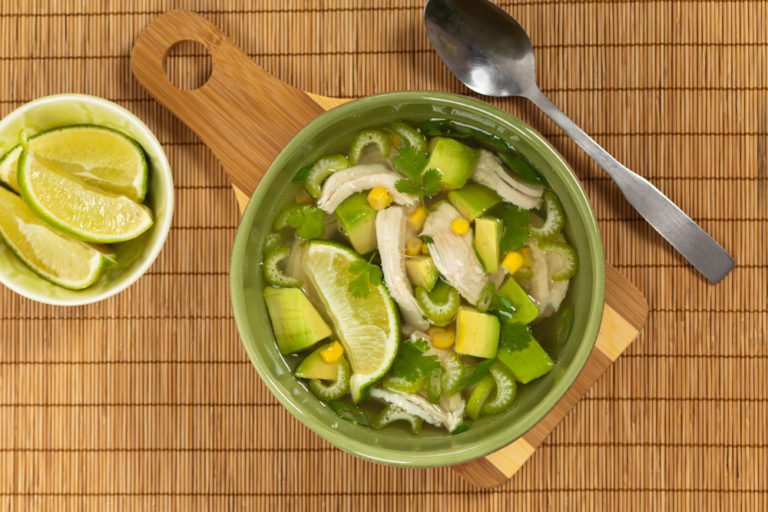 This delicious soup has such a citrus kick, it's the perfect lunch-time meal. Just make it quickly when you're at home or bring it to work in a Thermos.